My previous favorite cleansing foam, The Face Shop's Calming Seed Mild Bubble Foam Cleanser, has been discontinued, much to my dismay. Up till now, I still couldn't find any cleansing foam that suit my skin as well as it. However, I'm currently using Milk Moist Cleansing Foam from A'pieu, in Rilakkuma edition, for my daily cleansing routine. I couldn't say that it works that well on my skin but at least, it doesn't make my skin get too dry. On the days I use makeup, which is almost everyday, I use Clarisonic's Mia 2 with its Sensitive brush head to cleanse the makeup residue well. I used to do multi-cleansing when I use makeup but after arriving in Korea and doing my makeup everyday, it gets pretty tiring. 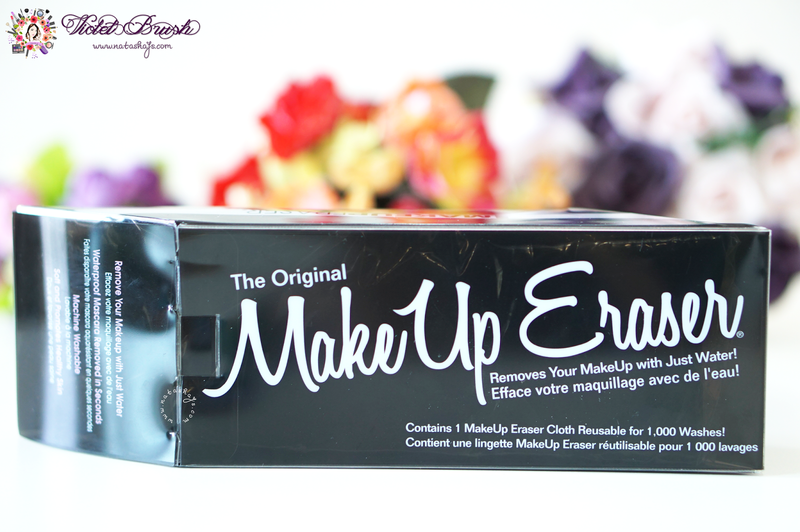 I decided to try this Makeup Eraser which claims to be able to erase my makeup with only water and it works! It cleans my makeup as well as my multi-cleansing routines did. How do I know, you ask? Well, I use Clarisonic and the makeup residue left on my Clarisonic brush is almost the same as when I did multi-cleansing. Pretty amazing, huh? Some of you might ask, why do I need to use SK-II's FTE when I'm still this young? So here's the story. My skin got irritated a while back which caused me to have rash on my right cheek. It was caused by a toner so I tried to find another toner but every time my skin got exposed to alcohol, the rash would get worse. It came to the point where I even visited dermatologist but it didn't help much. My mom eventually suggested me trying SK-II's FTE so I gave it a try and it worked. My rash is now gone but I'm too afraid to change back to toner again so I keep using SK-II FTE as the first step of my daily skin care. My skin is pretty dehydrated, which means it gets oily on the T-zone sometimes but it gets dry easily too. Due to that, I need to apply three layers of moisturizer to keep my skin hydrated. First layer is Laneige's White Plus Renew Emulsion. Second layer is Laneige's White Plus Renew Original Cream_EX. Third layer is SK-II's Cellumination Deep Surge EX which I only apply on around the nose and on my chin which tends to get dry more easily than the other areas. Normally during summer, I only use the first layer. The eye area also needs to be moisturized and I use the same product as before which is The Body Shop's Moisture White Shiso 2in1 Brightening Eye Cream. Winter season doesn't mean that your skin doesn't get exposed to the harmful radiation of UV rays, that's why I still use sunblock with SPF50+ even during winter. 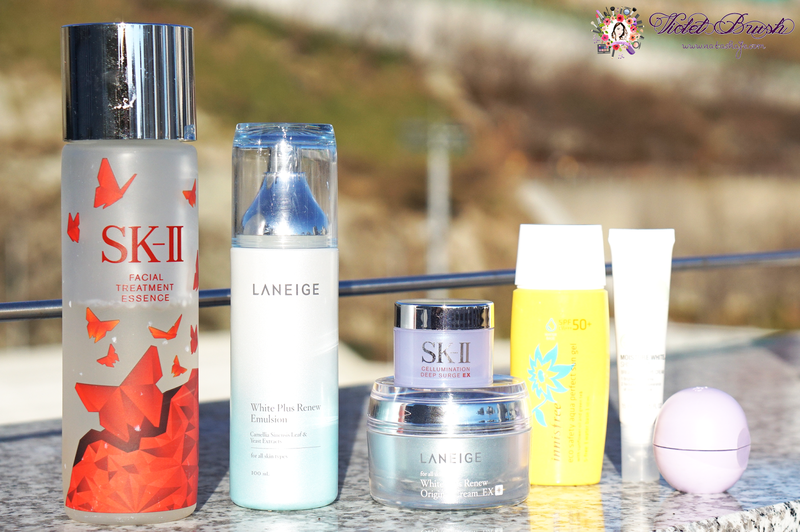 I choose gel type of sunblock because simply, it absorbs fast and not sticky on the skin. As for my lips, I'm using EOS' Sphere Lip Balm which is not heavy on the lips and works pretty well in keeping my lips moisturized. However, I still need to reapply once in a while after a few hours to avoid my lips getting chapped. I don't use these three everyday, but instead on the days when my skin needs these (read: when I remember). 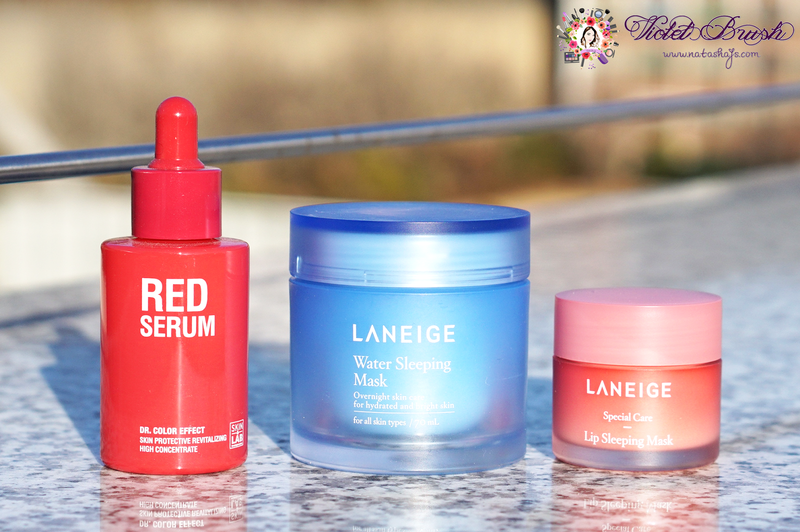 I often forget to use these, especially the serum but I will always use Laneige's Water Sleeping Mask and Lip Sleeping Mask whenever my skin and lips feel dry. As for acne care, I still use the same product which is Tony Moly's AC Control Deep Pink Spot. I also still use the same facial mist, Nu Skin NaPCA Moisture Mist, any time during the day when I feel like my skin needs extra moisture. 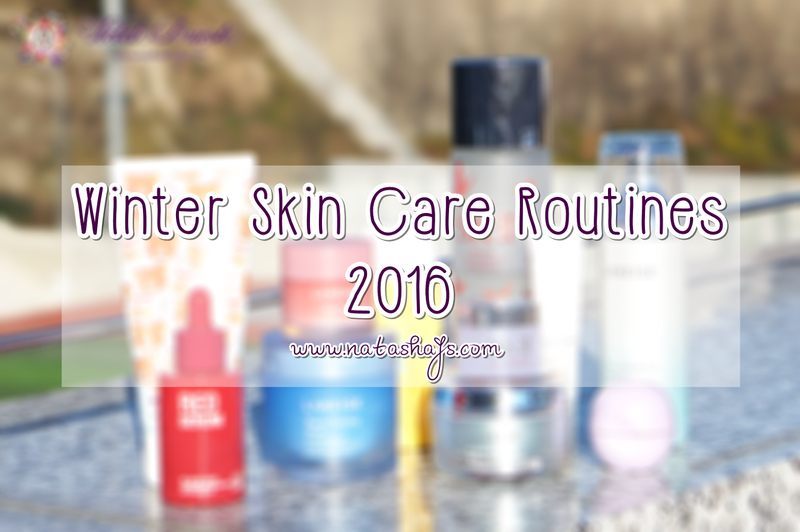 The photos of these two products could be found on my previous skin care routines post. Nath yg handuk itu beli dimanaa? Hai, Natasha, salam kenal ya! :) Btw aku agak salah fokus ngeliat Clarisonic-nya itu :( Kira-kira kalau di Indonesia beli dimana ya? 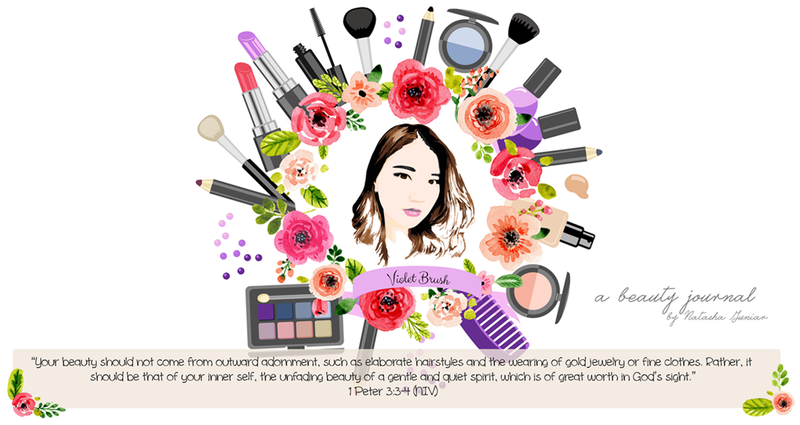 Aku denger-denger cuci muka jadi lebih bersih pake itu daripada pake jari? I also use the same cleanser as you and I get it just because the rillakuma things lol for me it just so so. but didn't dry out my skin, it also doesn't feel amazing. pengen banget nyobain Clarisonic .bGaus mana sm bioderma ka ?